Not many seven-year-olds have their own squad, but Jayna Stutler is no ordinary first grader. When she was diagnosed with Type 1 diabetes at the age of three, those closest to her couldn’t tell much difference in the way she acted. “When I pictured someone with diabetes, I always associated it with someone who was overweight or old, but certainly not my innocent spunky little girl,” said Jayna’s mother, Amanda. According to research, there are a lot of misconceptions about diabetes, especially with Type 1. Although both types of diabetes involve insulin, Type 1 is not related to poor eating habits, obesity, or lack of exercise. While the disease can be difficult to manage, it does not limit involvement with sports and it is not curable. Unquenchable thirst, frequent urination, blurry vision and fruity smelling breath are some of the first noticeable symptoms of Type 1 diabetes. After being completely potty trained for months, she suddenly started having accidents, prompting a hospital visit. The doctor started talking about blood sugar levels, fasting and further tests, a conversation Amanda didn’t expect, given that her daughter was still acting normal. The fasting part of the process was particularly challenging for Jayna but the doctor promised a snack right after the tests were finished. True to his word, snacks were given and a before and after blood test confirmed their fears: Jayna was, in fact, a Type 1 diabetic. To date, Jayna continues to enjoy a very normal life, attending Simpson Elementary School, taking tumbling classes and playing sports. 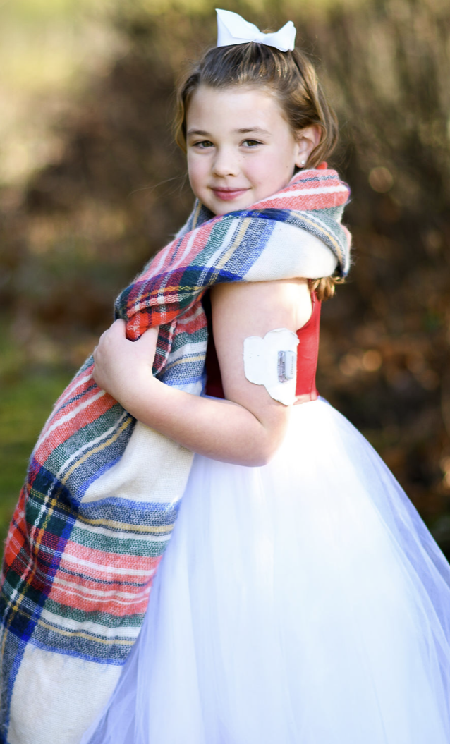 She wears an insulin pump and a glucose monitor to help her manage and monitor blood sugar levels. In July, the Stutler family will be marking the four-year mark for Jayna’s diagnosis. This year also marks her first opportunity to attend Camp Kno-Koma in Greenbrier County. The camp, which started in 1950, provides a summer camping experience to children with diabetes. Surrounded by counselors and other children with diabetes, campers are free to learn and have fun without feeling uncomfortable about the disease. Jayna has been looking forward to attending the camp for years, as they require kids to be at least seven to attend. Although she is thrilled to be going, her first concern was for others. The fact that some children could not afford to attend Camp Kno-Koma was heartbreaking to her, launching her into forming her squad: JSquad. The facebook group was started in an effort to raise awareness of Type 1 diabetes and to raise funds to offset the costs of attending camp. She has also spoken to local civic groups to make sure every child who would like to attend camp has the same opportunities she has, regardless of their income. The Jsquad Facebook page features information and education about Type 1 diabetes, videos of Jayna, and has even hosted an online auction of her old insulin pumps hand-painted and turned into magnets. For someone who hasn’t even started second grade, Jayna is already making a big impact on the Bridgeport community with her ingenuity, her determination, and mostly, her big heart.